Arkansas, southeast Oklahoma, and northeast Texas. 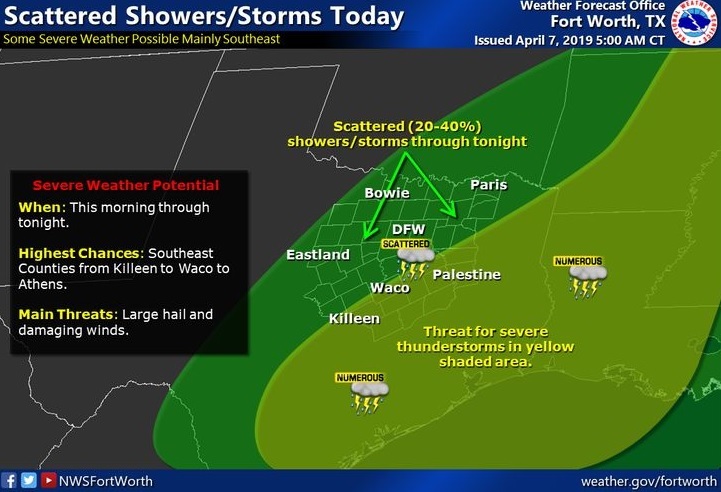 While isolated to widely scattered showers and thunderstorms will be possible this morning, showers and thunderstorms will increase this afternoon from the southwest, as the parent upper-level storm system begins to lift east northeast into Eastcentral Texas. There will be a threat for isolated strong to severe thunderstorms this afternoon and evening across Southeast Oklahoma and portions of extreme Northeast Texas and Southwest Arkansas, with damaging winds, large hail, and locally heavy rainfall possible. Where the heavier rains repeatedly move over the same areas, localized flash flooding will be possible. The severe weather threat will diminish later this evening, but the risk for locally heavy rainfall will persist through tonight. thunderstorms will increase across the region Saturday. radio operators may be needed this afternoon and tonight.